Manchester United manager Sir Alex Ferguson has called for Premier League clubs to be given a greater share of television revenue and demanded the influence wielded by broadcasters over the divisionâ€™s fixture lists be curbed. Though the 69 year-old knows allowing clubs to sell their television rights individually â€” as is the case in Spain â€” would benefit United, he stands by the Premier Leagueâ€™s policy of collective bargaining under which funds from the Â£1.6 billion domestic deal with Sky and the foreign rights sale, worth Â£1.3 billion over three years, are divided equally between all 20 member clubs. 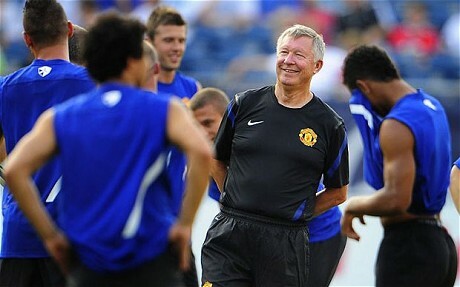 But Ferguson is adamant the demands placed on his team and their 19 rivals by television are such that the Â£60â€‰million United received from the Premier League’s domestic rights alone this season is not enough, with the Scot clear that clubs should earn more money in exchange for less interference. â€œI have no great feelings for [individual rights],â€ he said. â€œ[United] would love to have it but it should not happen. [The clubs] should have more control over television and how much access they can have, but in terms of the rest of the Premier League, it is fair to have all equal shares. â€œAt the managersâ€™ meeting at the start of the season, they told us they now sell the Premier League product to 212 countries. That is unbelievable. Television is God now, itâ€™s the king. â€œIt shows itself quite clearly because when you see the fixture lists come out now, they can pick and choose whenever they want the top teams on television. Ferguson made the comments in a wide-ranging interview with the BBCâ€™s North West Tonight, granted to mark the retirement this week of the showâ€™s long-time host, the former Krypton Factor presenter Gordon Burns. Ferguson, in typically searingly honest form, also touched on the â€œcrazy pricesâ€ paid by some clubs â€” no doubt including Manchester City â€” in what he dubbed their â€œdesperateâ€ search for silverware. â€œFinancially, I only worry about my own club [rather than the health of the game as a whole],â€ he said. â€œI am pretty selfish like that. â€œThere are a lot of foreign people running our clubs now and they are desperate to win something, their imagination stretches and they pay silly money for players, absolutely crazy prices. Ferguson, 70 in December, acknowledged that age has â€œmellowedâ€ him, insisting that he now finds switching off after games substantially easier. â€œI donâ€™t like losing,â€ he said. â€œIt is not easy for me. But when I was younger, I found dealing with people away from the game quite difficult. I switch off quite quickly now. The Scot also dismissed his infamous â€œhairdryerâ€ treatment as an exaggeration â€” â€œitâ€™s a myth; if I had thrown tea-cups as often as I am supposed to then weâ€™d have been through a lot of crockeryâ€ â€” but admitted he looks for familiar traits in his players. The most recent generation that applies to, of course, is that of Tom Cleverley, Danny Welbeck, Phil Jones et al, a crop the United manager believes can follow in the footsteps of Fergieâ€™s original fledglings. â€œI have a nucleus of young players at the 20 to 21 mark who can be regarded in the same way as the Giggs-Scholes-Beckham era,â€ he said.